Temples, temples, temples! It's all I ever seem to do. ;) This morning I had some of the vegan rice bread for breakfast, and it was delicious! I crave it even now just thinking about it. Yum! 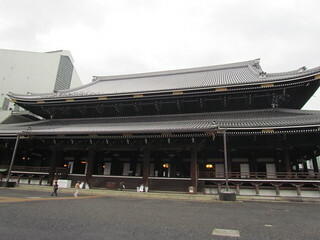 There were two big temples just a few minutes walk away from the hotel, so this morning I headed out on my own for a visit. 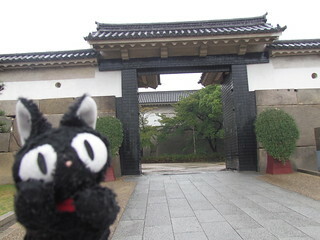 First stop was Higashi Honganji, Higashi means 'East'. 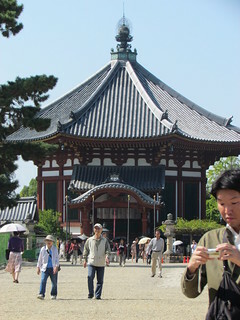 This was a very pretty temple, though largely was a reconstruction. 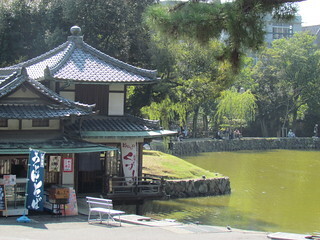 But then, most things in Japan are reconstructed. 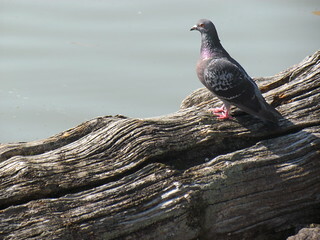 Most things are made of wood, and it turns out that throughout history and conflicts wooden things burn down really easily. 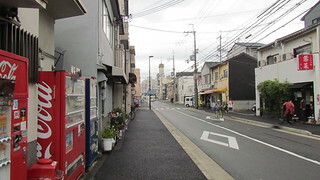 It is a short walk from Higashi to the next temple. Just walking around streets in Kyoto is fascinating! 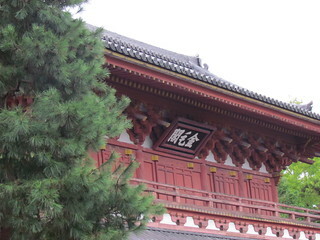 Next stop, just a short walk away, was Nishi Honganji, or the 'West' temple. 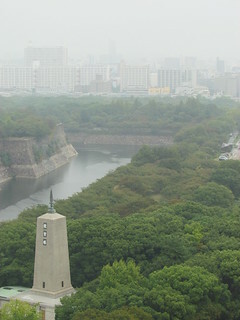 This was similar to Higashi, but seemed bigger and there were more people around. 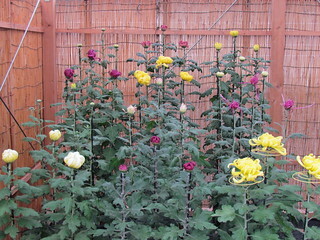 There were some nice flowers. I went back to the hotel for lunch via 7-11, picking up some salad with a vinegar dressing (meh) and some of my beloved grilled onigiri. 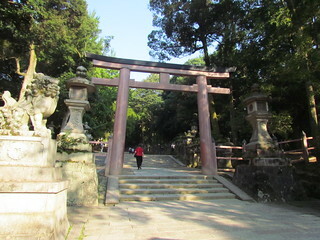 Then we hopped on the subway out to Kitaoji for walk to our next temple. Except we walked the wrong way, so caught a taxi instead. Silly. 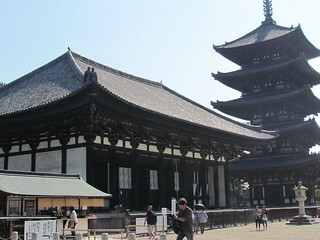 Daitoku-ji is a large complex that contains twenty-two sub-temples. 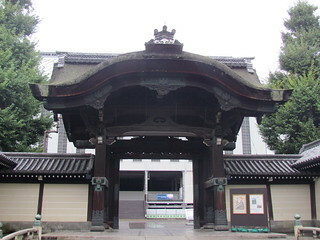 It has a famous Hatto building and Sanmon gate. 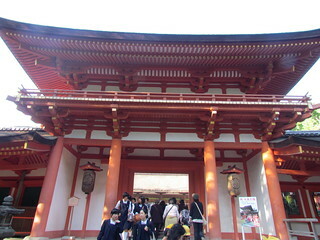 But the main draw has to be wandering around between the various sub-temple grounds. Many of the sub-temples were closed to the public, but we were able to visit two. 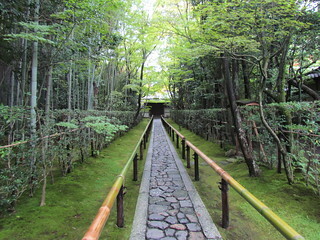 The gorgeous Koto-in is a serene moss-covered building, and was pretty much my favourite place of the entire trip. Walking around the cool grounds, you can't help but feeling complete peace and tranquility. I could have stayed here forever, just letting the calm wash over me. 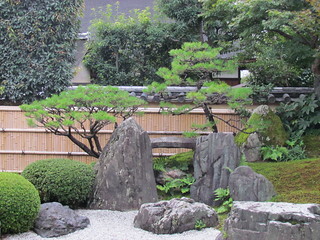 If you are anywhere near Kyoto, make sure you visit this place. It will completely enchant you. 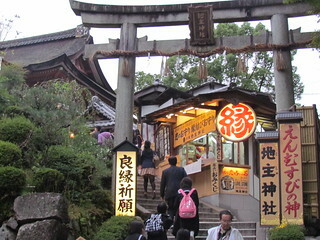 We had planned to go and pop into a vegetarian restaurant right next to the temple for a snack, but we couldn't find it! 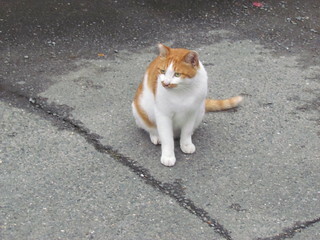 I did however see a pigeon friend, and a delightful cat. Kitty! 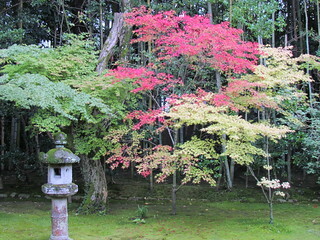 We stopped off at Kourin-in as well, another sub-temple, to view the pretty stone garden. 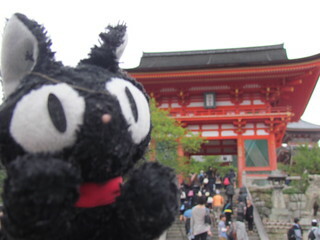 Our next stop was Kiyomizu-Dera, a very famous and beautiful temple. We caught a taxi there, and were a little surprised when we got in the cab at the faint grimace of the taxi driver. We soon understood why. Although not a long trip distance wise, there was a lot of traffic. Then the taxi driver had to drive up a very steep, narrow road leading up to the temple, battling against other cars, pedestrians and giant buses! We were very grateful to have a taxi up there, though, it would have been a steep walk! Even so, when the taxi let us out there was still a steep walk up to the temple itself. 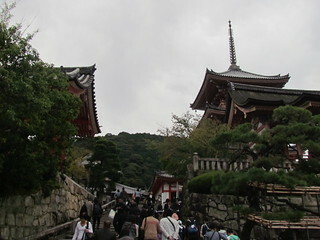 Kiyomizu-Zaka is the steep street leading up to the temple. It is full of shops with all sorts of touristy things, and teeming with people. 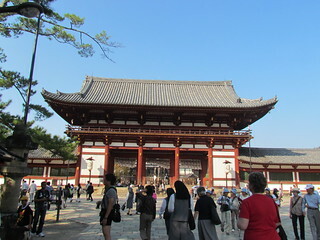 The big red gates are crowded with lots of tourists and school kids. Then it is a walk up more hills to the beautiful temple itself. The balcony around the temple offers some stunning views across the city and surrounding areas, though it is a bit of a steep drop if you look directly down! One of the big draws is the Otowa-no-tak. 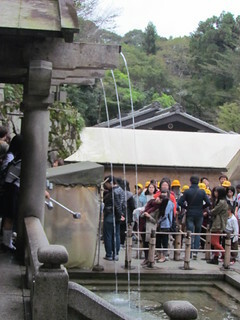 Under the main hall, the Otowa waterfall runs through three channels into a pond below. There is a huge line of people waiting to drink the water, which is meant to help grant wishes. After our temple visit, we walked back down the steep slope of shops, and I bought some pink glitter Hello Kitty chopsticks, before heading back to the hotel for a rest and a snack. Then we caught the subway to Sanjo Keihan for a walk through Gion. No geisha were sighted, but there were lots of men walking around. 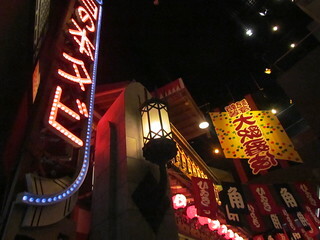 We also walked down the Shimbashi, which according to Lonely Planet is one of the most beautiful streets in the world. 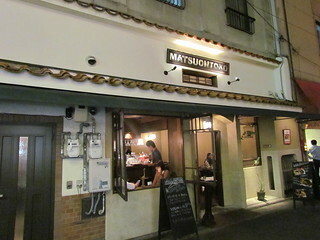 It was OK.
For dinner it was back to Matsuontoko Cafe. 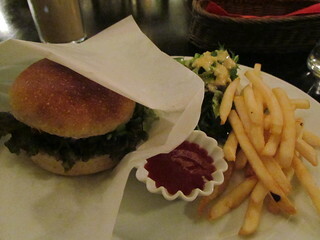 Dinner this time was a Namban (Southern Barbarian) Burger, which came with fries (OMG, potato, I love you!!) and salad. 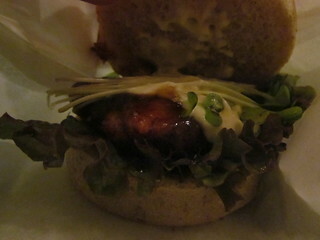 I'm not really sure what the burger was made from, but it came with a tartare sauce (yum) and did I mention the fries? After eating a lot of rice and a little bit of bread, I was craving potatoes. 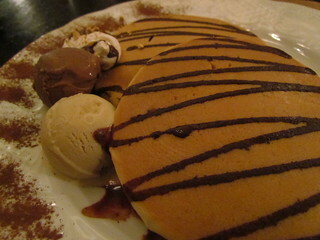 For dessert I had to try their pancakes. These were a lot heavier than pancakes I am used to, but they were delicious and sweet and carby. The next day dawned as a grey and dreary day, drizzling down with a chance of rain. Hmph. I started my day ordering off the hotel menu. 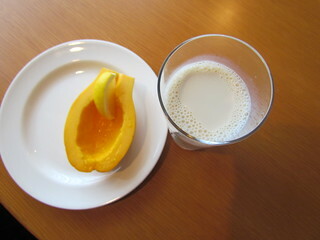 Half a pawpaw with a lemon slice, and some fresh soy milk. Oh, dear vegan friends, I am sorry to say... fresh soy milk is gross. At least to me. Dearest oat milk, I will love you forever! We had planned another day trip for today - this time to Osaka. This is a special place for my mother, as she attended Expo 1970 in Japan as a pavilion attendant for the Australian pavilion. We caught the local JR train to Osaka (about 40 minutes). When you get to Osaka station, the information kiosk there had some excellent maps and they were very helpful. I also had a banana oat snack bar, brought in my stash from home, for some morning tea. Exiting the station it was raining, boo. So we popped up our umbrellas and made our way over to the Osaka Museum of History. This is an excellent museum, I definitely recommend a visit. 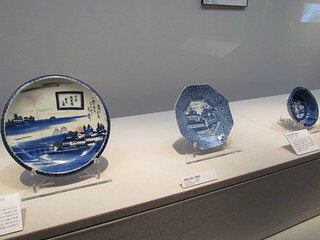 The museum traces the history of Osaka. 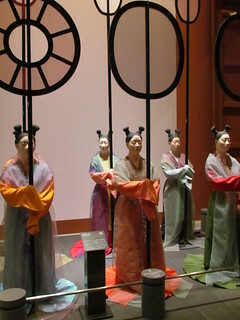 It combines artifact with recreations, like these Imperial Shade bearers from very early times. There are lots of English descriptions for things. You go up to the top of the building and work your way down through the ages. There are some lovely views over to the castle and grounds from the top floor. 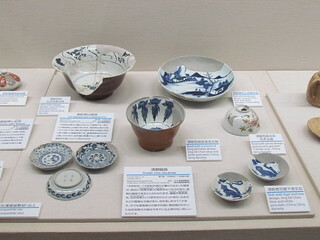 I love pottery and ceramics. Especially blue and white! 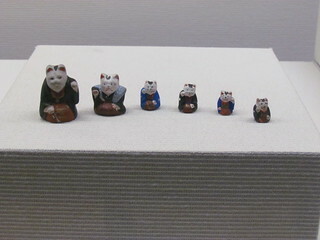 I also love little kitty clay dolls, like these. There were many more recreations through the ages. 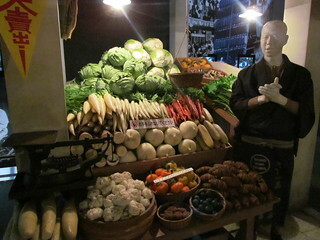 I loved this vegetable stall! My favourite part of the recreations was the transition from traditional to more modern times, which had some great dioramas. 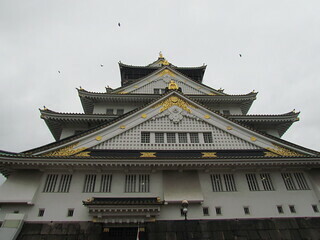 After a chocolate peanut butter snack bar (bought from Natural House in Kyoto) in the lobby, the rain had started to ease off so we walked over to visit Osaka Castle. One of my mother's good friends who had passed away a little while ago used to give tours here. 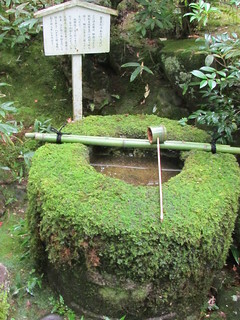 The grounds are extensive, including a lawn garden and a shrine, but we didn't spend too much time looking around at these. Mainly because everything was very wet, and about this time my feet got officially soggy. I don't cope well with soggy socks! 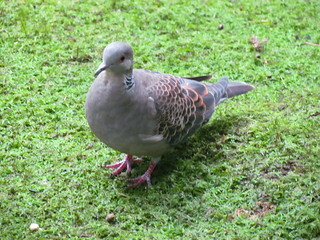 There are a couple of little food outlets on the ground. 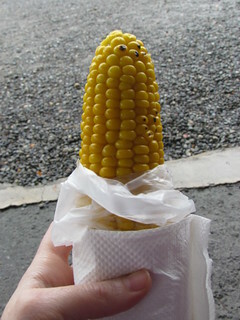 When I passed by one selling hot corn on the cob, I couldn't believe my luck! My mum asked to make sure that it had not butter on it, just delicious salt and pepper. The corn was grilled, and came wrapped in a bag rather than on a stick. It was perhaps the most delicious thing ever, on a cold rainy day with soggy feet. Just what I needed to revive me. The castle is one of the most famous in Japan, however it has been reconstructed and the inside has been made into a museum, so is nothing like the inside of an original ancient castle. 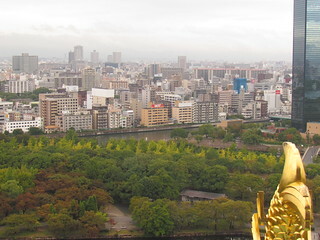 You start by going up to the top, where there is a nice viewing platform over the city. 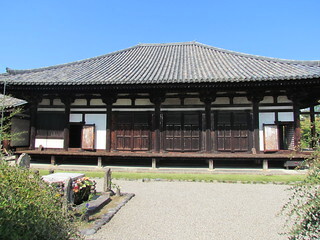 Inside, the museum told the life story of Toyotomi Hideyoshi, a central figure to the castle's history. Outside again, in the castle grounds, is the Expo 70 time capsule, which was nice for my mum to visit. We'd seen a recreation of it in the Museum of History. It was starting to rain again, so we caught a taxi back to the station. I had a Nut Snack (a nutty version of those Sesame Snaps), that I had brought from home. There were several other things I would have liked to have seen in Osaka - the bay, the ferris wheel, the famous lights at night, and an intriguing Food Amusement Park (though I can only imagine almost none of it would have been vegan friendly). However, given the rain and the cold and the wet feet, we jumped on a train back to Kyoto. I had several places marked on my Osaka Google map that were vegan or vegan friendly, however many of them kept odd hours and/or were not in the area we were in. If you are visiting Osaka, or day-tripping, I would suggest careful planning and snack packing. Back in Kyoto, my first order of business was warm and dry feet. Bliss! Then I ate some of my cookies and mochi that I had bought from Kairas a couple of days before. We decided to have dinner at one of the restaurants in the hotel, we went to a place called 'Le Temps'. I perused the menu, and then got my mother to ask for some pasta with just tomato sauce and vegetables, making sure that there was not animal stock or cheese in the sauce. The waiter was a little horrified. 'But it will have no flavour!'. 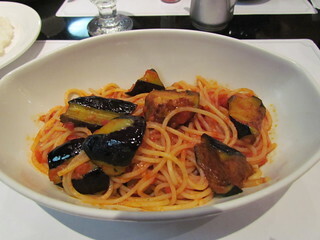 After being assured that it would be fine, I was given a bowl of spaghetti with tomato sauce and eggplant. It was simple, but yummy. I also had some left over rice from my mother's meal. While we were there, there was a Halloween costume parade for the kids, because it was coming up to Halloween. We took an after dinner stroll to the Isetan department store in the station to check out their amazing grocery and prepared food sections. Amazing vegetable selection! Again, most things in the prepared section were not vegan, I wanted some inari but none of it was animal free! But still, I had some chestnut mochi in my room, so I was OK.
After a much needed ten hour sleep , I snacked on some banana and the delicious fresh yuba before we headed out for our first day trip - going to Nara to explore. 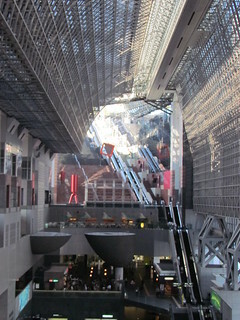 After buying our tickets, we had an hour before the train left so we spent some time exploring Kyoto Station. 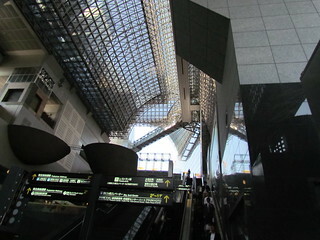 The station building itself is amazing, and giant! 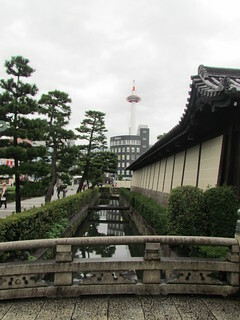 It has interesting architecture, art works, lookouts over Kyoto, a ten-floor department store and a rooftop garden. It is well worth a wander around. 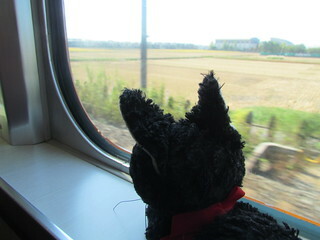 We caught the Limited Express to Nara, where my travel cat Francesca enjoyed the view and I had a nut snack bar. Arriving in Nara, we picked up a map, which was kind of confusing because it had no street names! 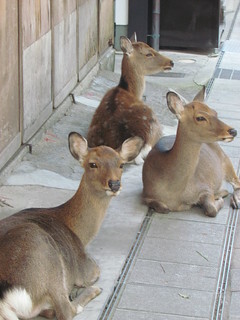 Nara is famous for the deer than roam many areas of the town. Walking out of the station, we were immediately greeted with several of the beauties. 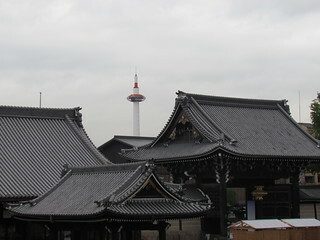 Our first stop was Kōfuku-ji. 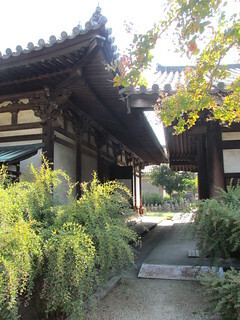 While part of the temple was under reconstruction, there were still many beautiful buildings to see. We also went through a treasure hall, which was like a mini-museum. 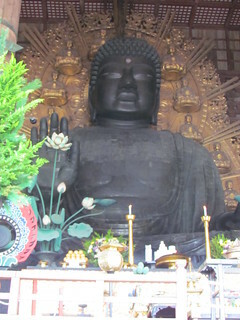 In the hall is an amazing statue of a Buddha that has been in the same place since the ninth century. 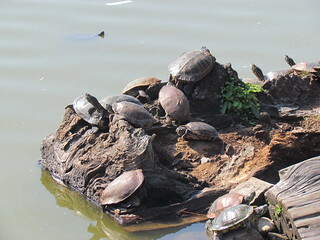 Wandering away from the temple, we found ourselves at Sarasawa-ike, a lovely pond that was teeming with turtles and a friendly pigeon. 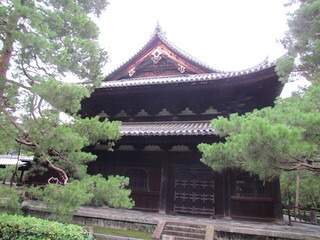 While it wasn't a planned stop, we happen to pass by Gangō-ji. I am so glad we did. 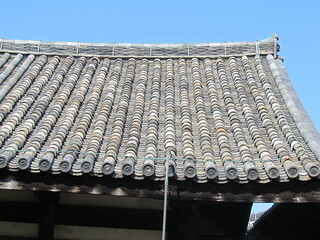 This lovely place in the oldest Buddhist temple in Japan (though the temple was originally built in another city), and some of the sections the roof tiles are from the original structure. 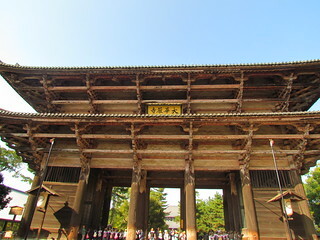 It's worth a small detour from some of the major Nara sites to visit here. We came across the temple while we were walking to Ashura for lunch. Ashura is a small vegetarian restaurant where you sit on the floor at low tables. They have an English menu, with one side listing vegan dishes and the other dishes with dairy and eggs, so ordering for a vegan is very easy. 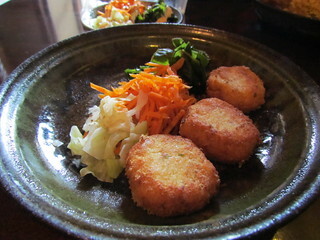 We started with some tofu croquettes, which were lovely and came with some fresh salads. 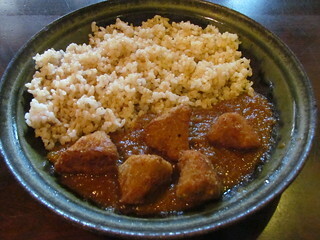 For the main, I had the 'curry with gluten and rice', which was simple but tasty. Afterwards we wanted to head out to Nara Park. Turns out taxis in Nara are very hard to find, but thankfully the owner at Ashura had given my mother instructions in Japanese to find the bus, and I used my apparently amazing public transport abilities to get us to the right bus and the right stop. 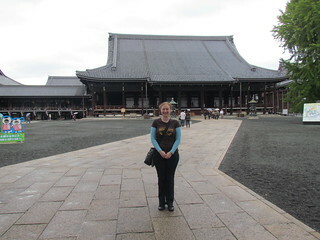 Our destination was Todai-Ji, right in the middle of Nara Park. 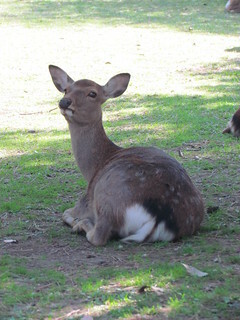 Nara Park is filled with deer, there were hundreds of them roaming around. You can buy deer crackers to feed them (I didn't). 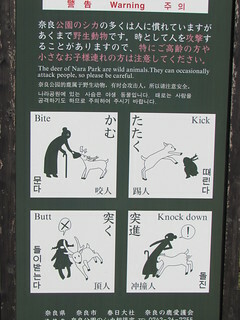 There were also several signs about the danger or deer, which was kind of amusing. Apparently every year they have sort of a deer rodeo where they catch deer to cut off their antlers, which sounds not so fun to the deer to me. 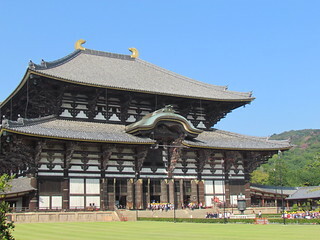 Probably the main reason most people go to Nara is to go to Tōdai-ji, home to the world's largest bronze statue of Buddha (Daibutsu). Yeah... Giant Buddha is GIANT! None of my photos really captured the scale of it, but it is huge. 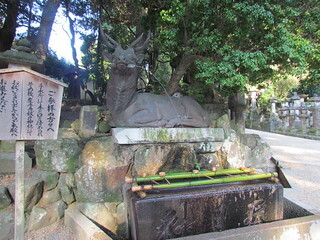 After visiting the Daibutsu, we wandered through the park (and the deer) up towards the Kasuga Taisha Shrine. This was an 800m walk, which seemed to take longer than expected, and much of it uphill. 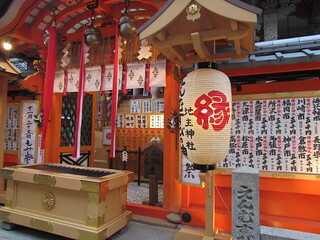 It is a lovely shrine, with many beautiful bronze and stone lanterns. 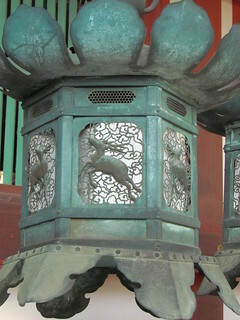 Many of the bronze lanterns had deer on them, the deer certainly echo through the whole place. A bus stop was not far away, and after a tense moment thinking we'd missed the bus and would be waiting for an hour, thankfully a bus arrived to take us back to Nara. This time we caught the regular express back to Kyoto (more stops). I snacked on some broccoli chips and my tea and raisin cookie from Kairas. Back in Kyoto we headed out for dinner. Mum was craving some okinomiyaki, so we went back to Teramachi (a long covered shopping street near Nishiki) to check out Mr Young Men. I had read on a blog that the could do vegan okinomiyaki, but when my mum spoke to them they said they had never been able to do that and certainly couldn't do it now. Another lesson to be wary of blogs! We tried Hale again, but it was closed... again! 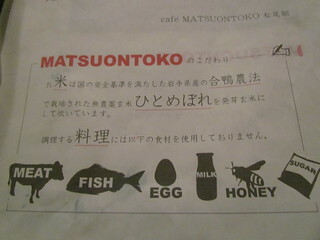 So, after consulting my Google Maps and walking comically around in circles for a bit, we found Cafe Matsuontoko. 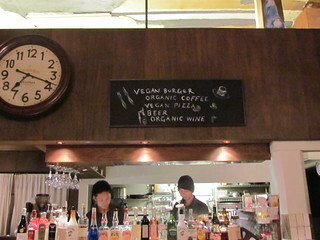 Matsuontoko is a complete vegan cafe, that has quite a pretty tasty menu at that. We were pretty hungry after our Nara adventures, and keen to try several things. 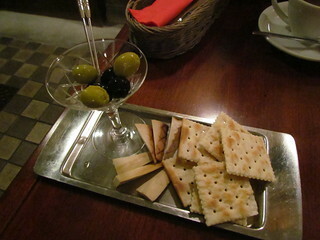 We started with some Smoked Tofu and Olives, which was a pretty small appetizer that came with some crackers. 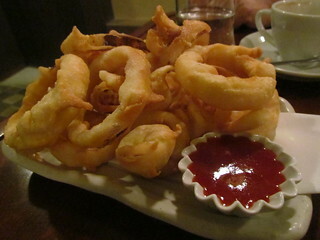 Thankfully, the onion rings were plentiful, but could have done with a bit less batter and a bit more salt. For the main we both had the Vegan Hamburg Set, which also came with a choice of drink. 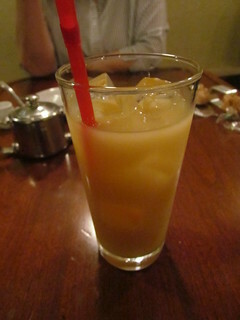 I had a grapefruit juice (I love a good grapefruit juice). 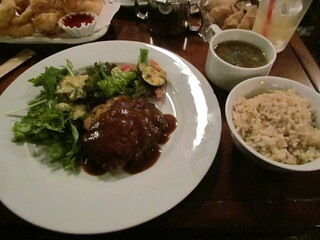 The set also came with some delicious onion soup and a salad with a great dressing. 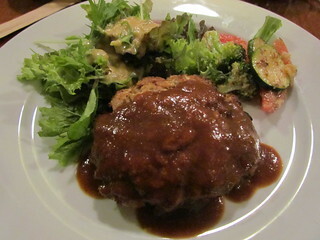 The hamburg itself was a chewy patty with a sweet sauce. I was hoping it would be the same as the Mumokuteki hamburg, minus the possibly fished sauce, but it didn't quite live up to my hopes. 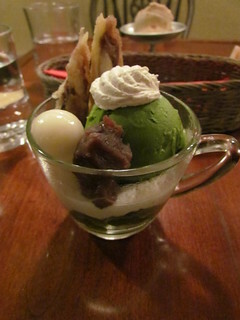 For dessert, mum had a Wafu Parfait, which came with green tea ice cream, green tea jelly, rice balls, cake and cream. 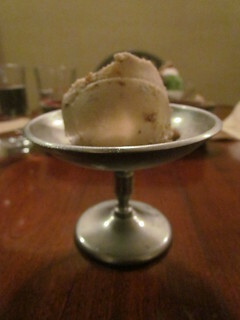 I had a rum and raisin ice cream. The ice cream was nice, but not quite the creamy sort of texture I have gotten used to with So Delicious and similar brands being available at home.